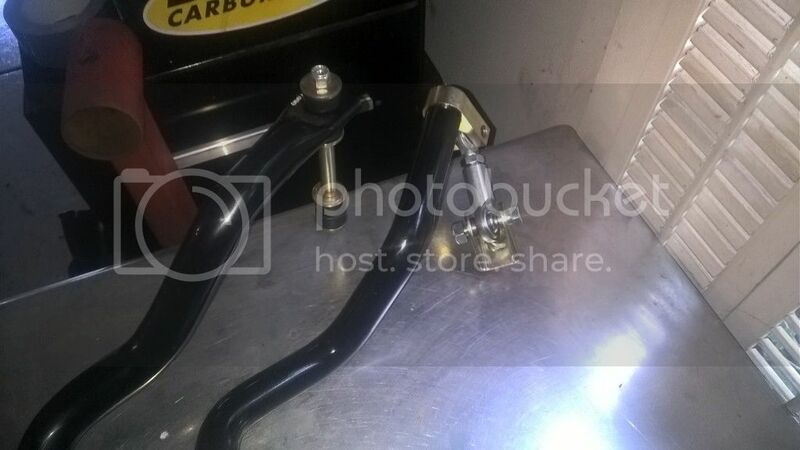 new high clearance front sway bars!!!!!!!!!!!!!!!!!!!!!!!!!!! We just got in the first 15 high clearance front sway bars!! Most of you that corner hard know that the tire will hit the sway bar, bigger tires increase this problem, hollow bars are AWFULL!! they are bigger and have big sweeping curves that reduce tire clearance, some aftermarket bars have less clearance than the stock 1 1/4" bar as well. 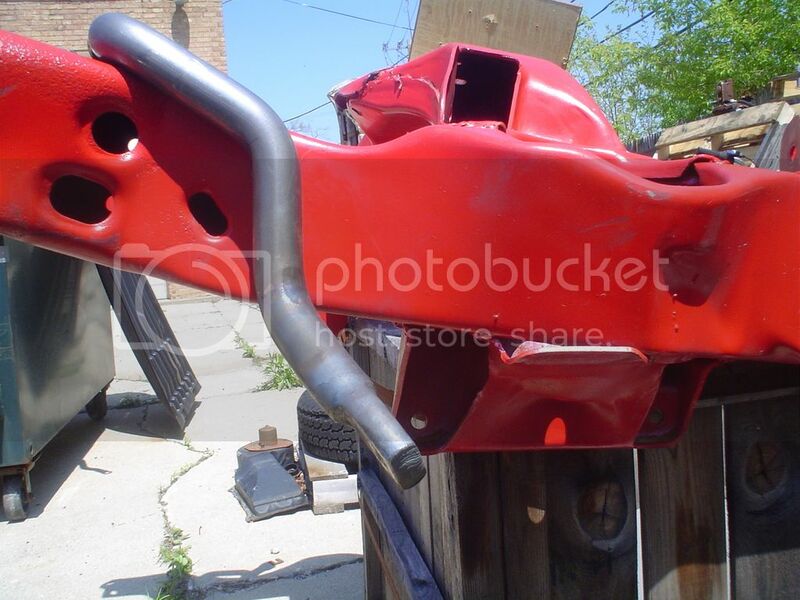 We have redesigned a front bar to allow up to 6" back space wheel on a stock frame!!! this means you could run as much as 10.5 wide wheel up front and maybe even 11" if the car is not too low WITH A STOCK FRAME!! 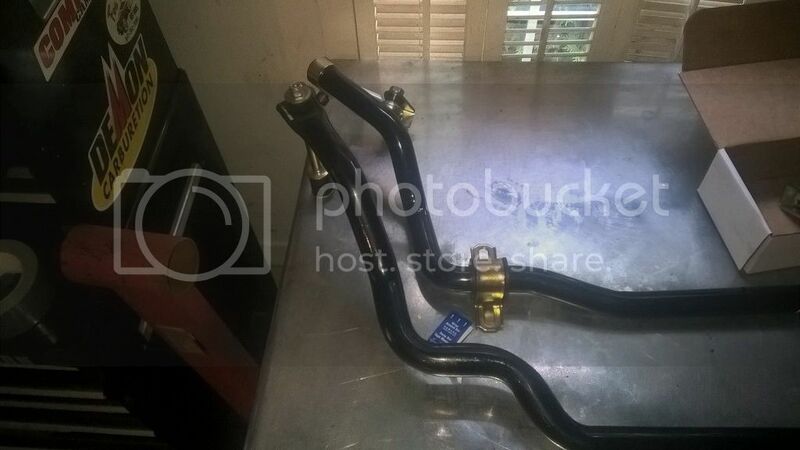 Re: new high clearance front sway bars!!!!!!!!!!!!!!!!!!!!!!!!!!! Pics of new bar next to stock? 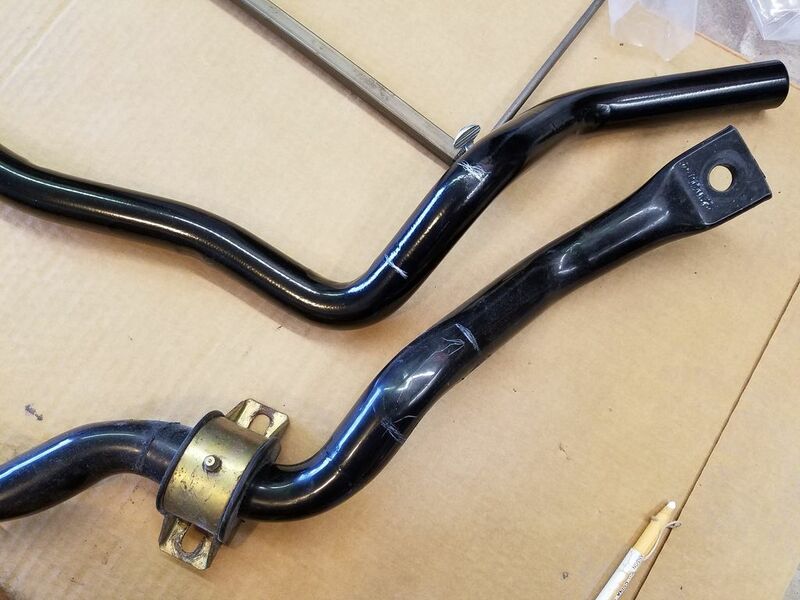 We've been doing some mechanical bending tests on various front sway bars, here are some of the results. Tests are performed at 1" of deflection, the resulting numbers CANNOT be compared to ANY other that you may find on the internet, these are comparative tests, all bars are tested in the same manner. Thanks for posting the results Dave. For anyone interested in PTFB's new sway bars, they are very nice. The ends on the standard version are very beefy where it mounts to the sway bar links. I will just start a new thread on the sway bar differences. What kind of tire sizes can we start running? It seems like there's a lot more 18" choices. With 17" I've only seen 275/40 17, 285/40 17 or 315/35 17 for choices. I've got 285 30 18's on the front on 10" rims. I'll be installing the new GEN II sway bar as soon as it arrives. I ran 275 40 17 Yokohamas before on 9.5" rims with 5.5 backspacing and they rubbed my fat hollow sway bar (from different manufacturer) at full lock. When I installed the new 18's with even wider rims and tires and more backspace I installed steering limiters knowing the tires would rub the old sway bar too much. Now with the new GEN II sway bar that may not be an issue. I'm going to start assembling and testing subframe accessories and suspension components this week. Did you get the adjustable or standard version? 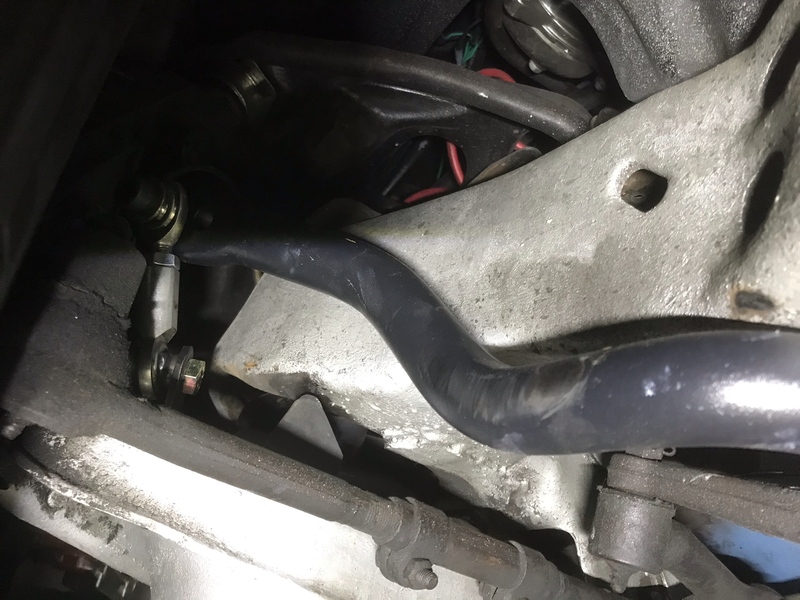 I'm 95% positive the fat hollow sway bar that Dave just tested (I supplied it) is the same one you have. I guess maxed out with 17" wheels it's either 285/40 all the way around or 315/35 Rear and 275/40 up front. It seems like getting 315/35 17 up front is not possible but I haven't done the measurements. Maybe it depends on the tire too. I know that tire article you posted not too long ago showed how the same numerically titled tire actually yields different measurements across brands. 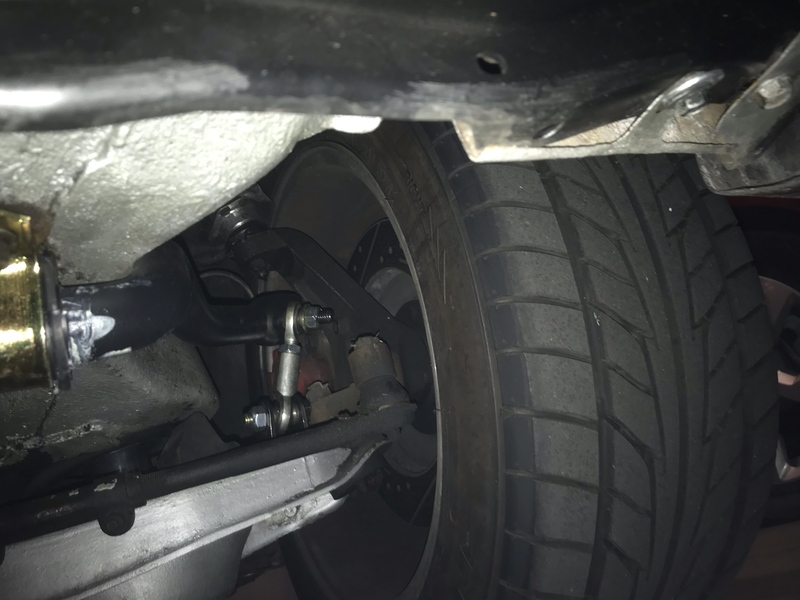 This first pic shows a stock 1 .25" bar the end of the bar can swing about 6.5" above the bottom of the frame, this is important if the car is lowered you need to have up swing under bump. It has only 350# of resistance as compared to a STOCK 1.250 solid at 380#, it's upward swing is only 3.5 above the bottom of the frame, not good for a lowered car. Next is the PTFB high clearance bar rates at 460# and swings up 8" above the bottom of the frame. Yes, my old bar is the same brand 1 3/8" OD hollow bar you had. I had 275 40 17 Yokohama DOT R track day tires on 17 X 9.5 front wheels with 5.5 backspace and they just rubbed the bar at full lock both directions. I wouldn't run a front 285 tire on track with the hollow bar without limiting the turning radius or reducing the backspacing (pushing the tire out beyond the fender). If you got into a situation on track where the back end got loose and you turned to full lock on the steering in a drift the front wheel that rubbed on the bar might skid since they'd probably already be at the limit of traction sending the car off track instantly. So when I moved up to 18 X 10's with 6" backspace and 285's up front I installed steering limiters on the spindles supplied with the new Baer brakes. Now, with this new bar I'll see if the steering limiters are still needed. 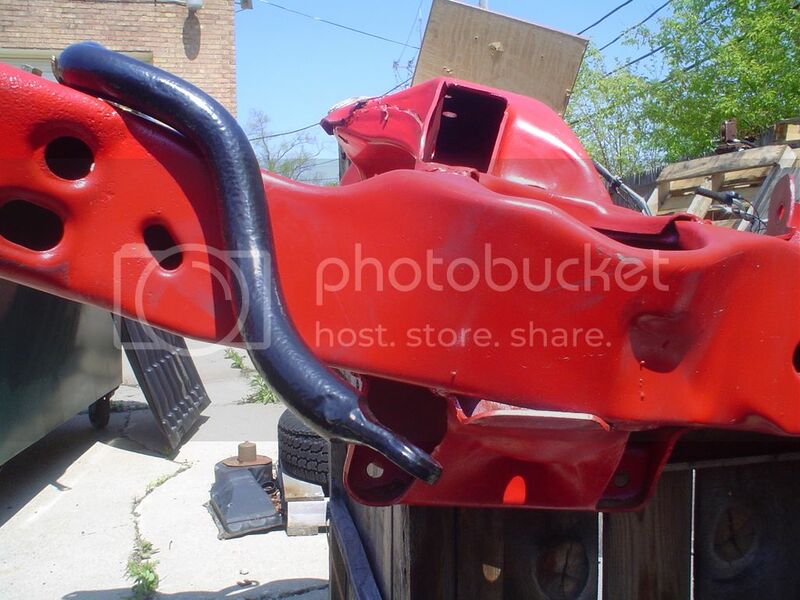 I've been doing a complete bare metal frame off restoration/race car build my 70 bird during the past 5 years. The car started out as an Esprit Icreated a sort of TA clone out of building a cruiser back around 1990 and it slowly evolved into a car used mostly on tracks with a bigger engine, full roll cage, Nascar seats, fire systems etc. 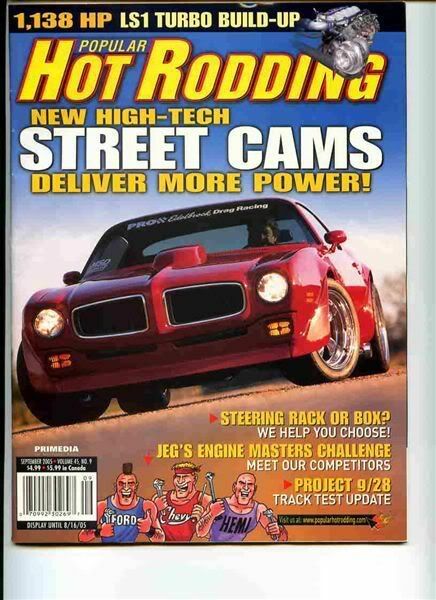 Road race HPDE's, Land Speed Racing, and drag strips were common uses while remaining street legal and being regularly driven on the street. Dave at PTFB and I have been in contact for many years and during the refresh I started buying some of the PTFB parts I'd always said I wanted when I did a full rebuild. So I bought PTFB solid body mounts, spherical front spring eye bushings for the rear springs, and adjustable G-braces. As I got involved reinforcing the sub frame Dave and I spoke more frequently since I wanted to be sure all the things I was fabricating would work well with the PTFB products I was installing during the rebuild as well as other things like the GEN II upper control arms I would need to save up for and install after I got the car reassembled. I have now started producing a number of different products to upgrade 2nd gen subframes and PTFB has become a sponsor of "The 14 Car" so while some of my original factory suspension parts will remain for a while I'll be installing some of the newest offerings from the PTFB GEN II catalog. As some of you may have seen, I posted about their new tubular upper control arms I received a few weeks ago. In answer to Jon's question I got the adjustable model PTFB GEN II bar which arrived a couple days ago. So, being a skeptic about these types of things I did some measuring to satisfy my curiosity. I figured since I was going to do that I'd discuss the bar with Dave and take pics and measurements. While I'm a "forum" guy with a history of writing lots of technical and project threads and posting in others threads in various forums all over the web who rarely misses a day on the forums Dave's a lot less active on the computer and could probably benefit from a publicist of some type. So I figured I'd compile things and present them here and post again during installation. I'll be glad to try to answer any questions I can if there's things I've missed but I'm not a suspension engineer so any really technical questions I'd rather have Dave answer. 1. More clearance for wider front tires mounted on wheels with deeper backspacing possible. Every car is unique so just because something works on one car doesn't mean it will work on yours. Measure, measure, measure before ordering custom wheels/tires. I measured the difference between my old aftermarket hollow bar and the new GEN II bar design and will measure clearances with the suspension assembled when I install my bar. I'll present measures of the bars by themselves below that indicate there is more clearance. Just because I provide info on what does or doesn't work on my particular car people shouldn't assume that the same things will or won't work on their car. Ride heights, suspensions, payloads, use of the car, and other considerations all come into play in the wheel/tire combo game so as they say, YMMV. 2. More frame clearance for lowered vehicles. 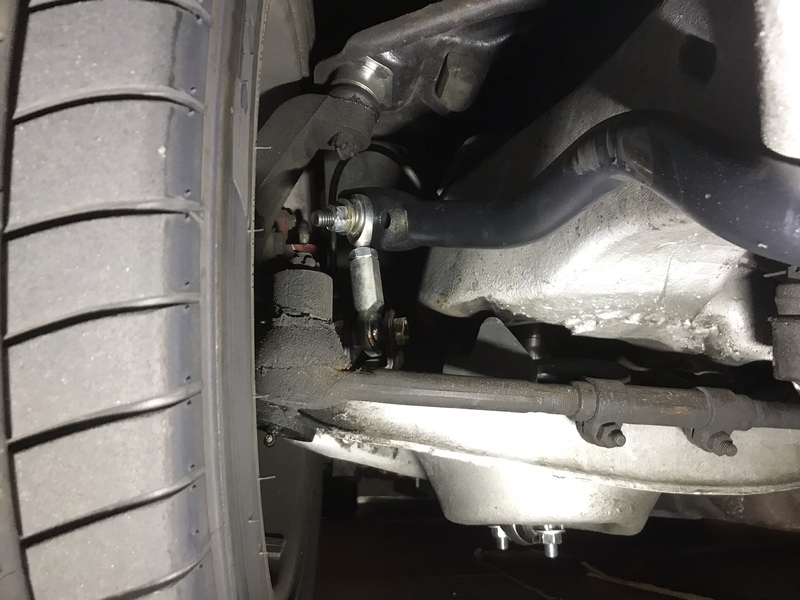 The design of some sway bars limits wheel travel when the car has been lowered from the stock ride height. Most folks wanting a burly sway bar like this have lowered suspensions. Dave can give the actual travel measurements, he told me what they were but I don't remember (noticeable difference). 3. High torque capacity powder coated 1 1/4" diameter solid bar. Dave posted figures above comparing a few different bars in a stand alone test that shouldn't be used to compare with any other figures since it wasn't done with any type of standardized testing procedure. The testing is only good to see the range of differences between bars not actual forces acting on your car. 1. The bars are about 10 lbs heavier than a hollow aftermarket bar so the drag racers and other "light as you can get" guys should be aware. In my own case I'm going with a new style light weight battery that's more than 10 lbs less than a traditional one so I figure it's a wash.
1. Features noted above for both bars and is installed with traditional style sway bar end links. 2. End links utilize 3/8" bolts with high durometer thermoplastic (Urethane) bushings. The urethane is stiffer than stock style rubber bushings reducing deflection and the thicker truck size 3/8" bolts are stronger with less flex than traditional 5/16" bolts used in many applications. 3. Can be used with stock or most aftermarket tubular lower control arms. 1. Features noted above for both bars. 2. End links comprised of adjustable heim joint. Eliminates bushings so there's no compression of any materials. Torque is transferred directly to the lower control arm.. Steering response is theoretically improved by eliminating "play" in the end link of compressible materials. Will have to test steering feel after my cars back on track to confirm. 3. The adjustable heim joint allows the distance from the lower control arm to the sway bar to be adjusted. This allows fine tuning the sway bar action to maximize cornering and steering response capabilities. Because our cars are all different weights, spring rates, shock setups etc. 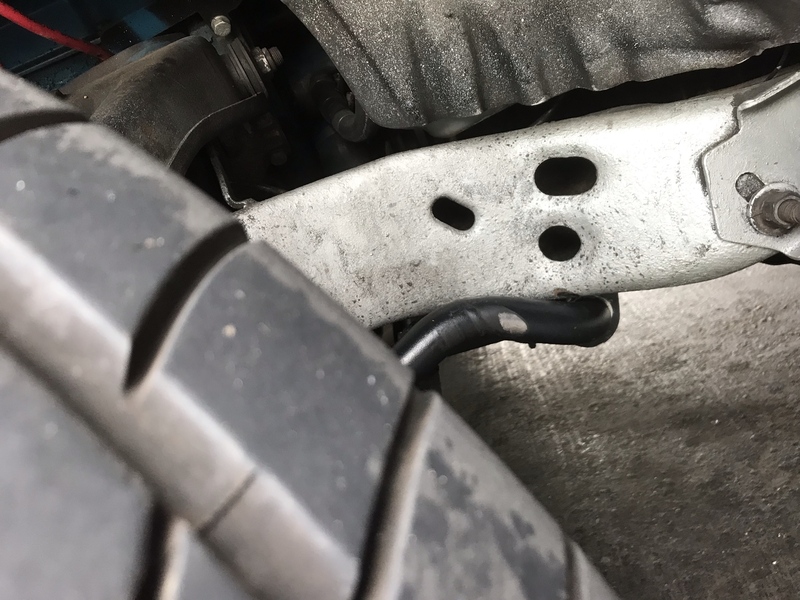 the adjustable bar should be able to be be fine tuned for an individual car rather than a standard "middle of the road"setting that traditional end link bars have. So in theory we can tune the bar to increase/decrease the under steer to help set our cars up for particular uses like auto X or particular conditions and venues. 4. Can be used with stock or most aftermarket tubular lower control arms. So with that all presented. Here's a look at the problem of trying to stuff the widest tires we can in the front so we can get the most cornering potential. In the pic below you can see where the 275 40 17 tire was hitting my 1 3/8" OD hollow bar over a 10 year time period. It really only occurred in tight parking lots etc. and didn't cause any safety concern to me because it barely touched at full lock. I knew however that moving up to a 285 30 18 on a 10" wheel with 1/2" deeper backspacing tire rub would certainly be an issue so I installed steering limiters which I may or may not still need to use depending how much clearance I gain with the new bar. Pics below; I marked my old sway bar at the center of the two points on each side where the tire rubbed the most. 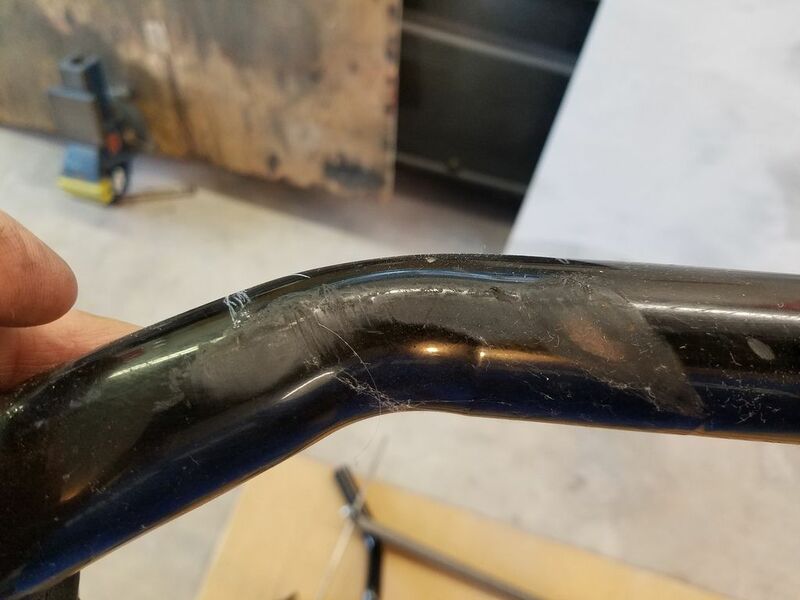 Then I measured how far rearward the tire contacted the bar from the center line of the frame mounts and transferred marks to the new GEN II bar. Next used my tram gauge to measure the overall width of both bars at the contact points. The GEN II bar is about 1/2" narrower at the forward contact point and about 1" narrower at the rear point. This may not seem like much because it's split between both sides but if I had that extra 1/4" - 1/2" on each side the 275 17's probably wouldn't have rubbed. A small amount of the difference is caused by the difference between the outside diameters with the solid PTFB bar being 1-1/4" and the hollow being 1-3/8". More importantly seems to be that the GEN II bar has a sharper bend just outside of the frame which is almost 90 degrees. Below is a pic of the adjustable end pieces with the heim joint. 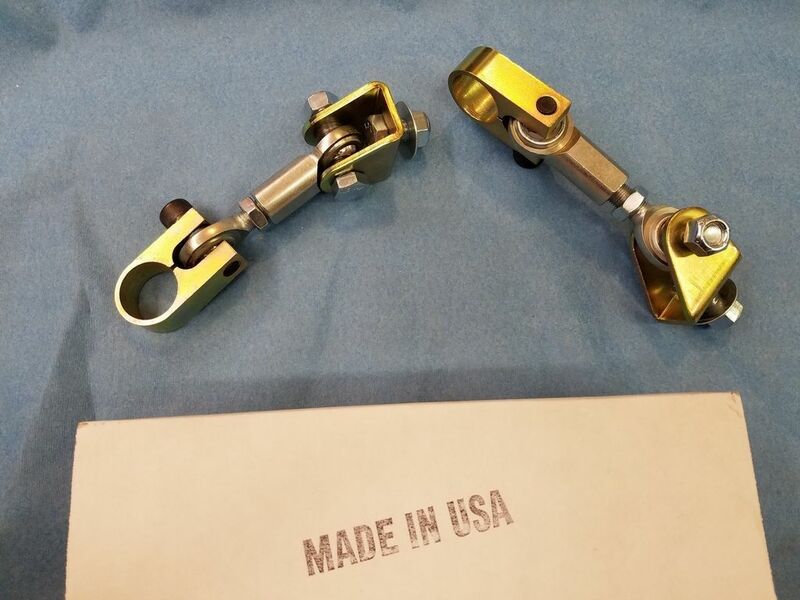 At first glance it might appear that the bar clamp and other parts might be anodized aluminum, however they are all very nicely machined steel with 1/2" cross bolts through the heim joint and lower control arm mounting bolt. I don't have a pic of the end links for the standard end link bar, maybe Dave can post one. Wow, great stuff. Going to have these readily available when I start putting my front suspension together in about 3-4 months? 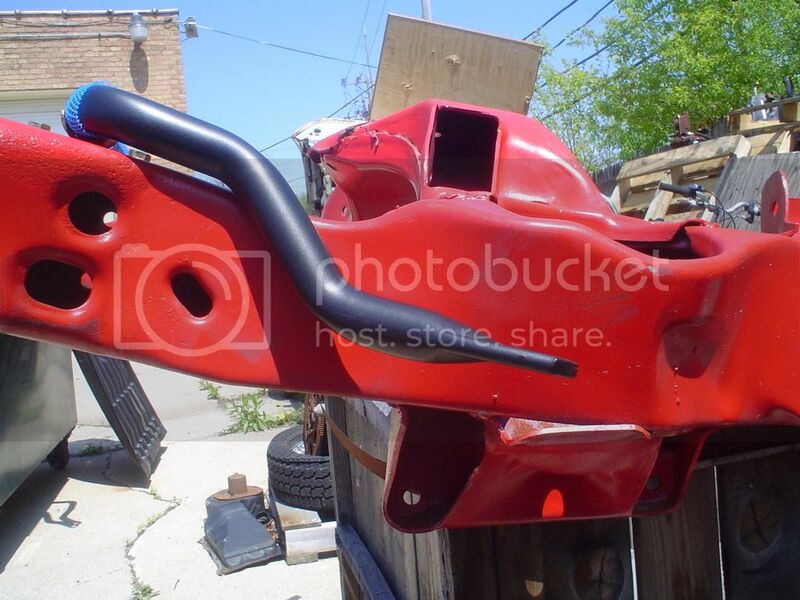 71 Firebird: 455, Formula hood, current project with a full Ridetech suspension on the way. 77 Trans Am: With original 400, future project. 73 Formula 350: 4 speed, full project. I once again want to stress the testing that was done was an A-B comparison of the sway bar only all the 1.25 dia. bars used the same mounting bushing (Energy Suspension frame bushing and brackets) and solid end link retention to eliminate end link variables, only the 1.375 dia. bar was tested with it's supplied bushings and bracket which is more rigid than the others due to the gussets on the brackets which would increase the bar rating slightly. We are seeing our competitors pointing to our test as "not accurate" because the parts we tested were "very old" when in fact the parts tested have only been on the market 6 months. 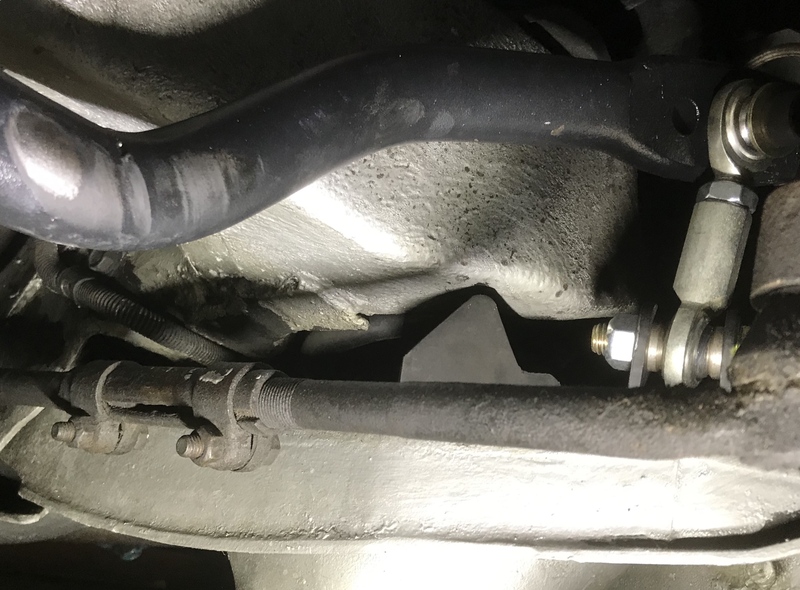 Now here is a picture comparing the PTFB adjustable sway bar end links (bearing joints) to stock style end links (rubber donuts) you get with most other aftermarket sway bars from companies like Hotchkis or Ridetech. Again, the bearing style end link is what you get with a PTFB adjustable sway bar. 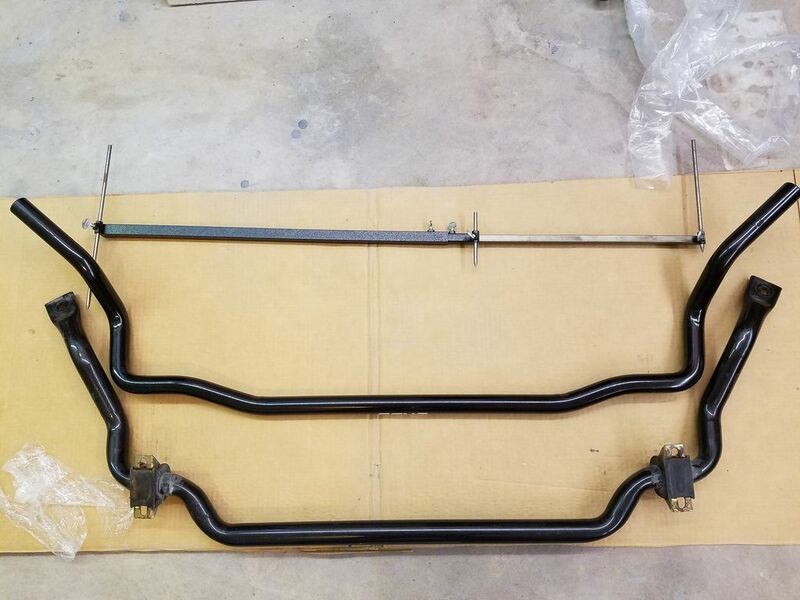 The PTFB 1LE sway bar, however, has ends like you find on a stock style or other aftermarket sway bar. 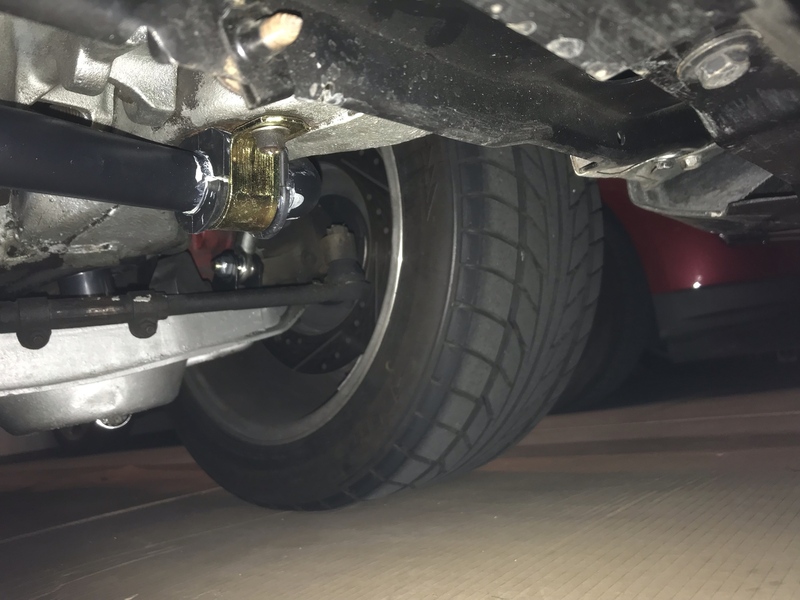 Notice how the end link on the PTFB adjustable sway bar is able to slide across the sway bar. This is what allows for sway bar rate adjustments. The end link is also able to adjust vertically for how high it is spaced away from the lower control arm. Are these in production still? If so, are these enough by themselves to fit 275/40/17s up front? I’m running YO 17x9 snowflakes with 4.875” back spacing on my 77TA. 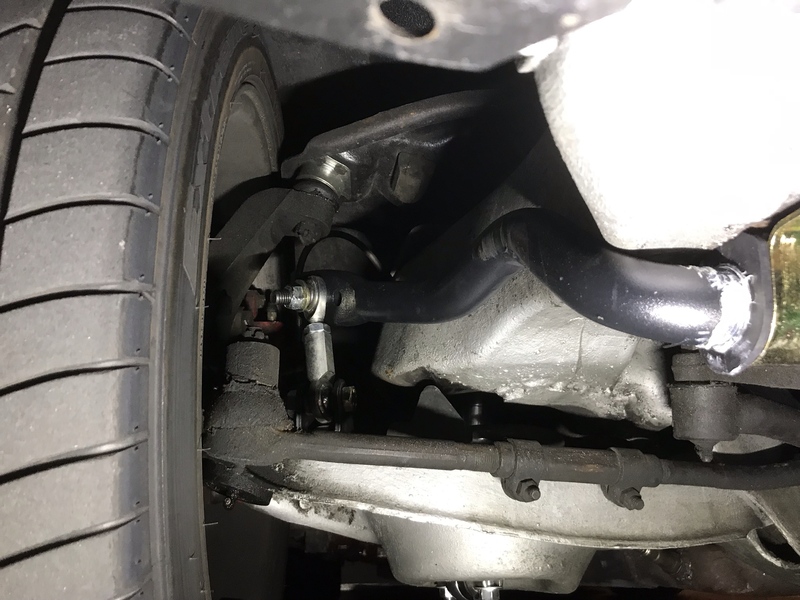 Stock control arms but running PTFB GT suspension with original PTFB sway bars. yes this bare is still being produced with some improvements in the past 1 year, the sliding clamp has been eliminated in favor of 3 hole adjustment. Thanks Dave - can you also please confirm this is all that’s required to clear the 275s on my YOs? Yes you will get 275s on the front, but there is no guaranty that you may not have some minor rubbing under hard cornering, camber,caster, toe, GM tolerances, all will affect the clearance, we've built in as much clearance as possible, I have customers with 315s on the front, many with 275s, a little rub will not hurt a thing IF it happens. I was able to get this sway bar installed this week. While the clearance for the tires seems better, the bar is hitting my frame on bumps making for some nasty noises. Not sure if others have had this issue? Is there a way to gain more clearance from the frame by using the end links or do you offer a spacer to assist? Stros, do you think you have some fender clearance to run a small wheel spacer to get it away from the sway bar? Hi Jonathon - I’m not having any issues with the wheel hitting the bar. I’m having issues with the bar hitting the frame. I think I need a way to get it a bit lower. Let me know if I’m missing something. Thanks! Ahh, now I see what you’re talking about there. You’ll have to call Dave. In some cases, I’d say to look into the lab-14 mounts to move the bar slightly but it appears the bend is a bit tight to the frame area in this picture. I know the bar was redesigned after what I had last time so I can’t comment. I know the last one I tested was clearing that area you’re talking about. Yeah I’ll give Dave a call Monday. Here are some pics of the end links and mounting brackets. I’m currently using the middle hole on the adjustable mount. Just drove it for a few miles but my turning radius with the 255s is much improved. Now that’s some good results! Hi Dave - while the tire clearance is better the rubbing noises are still prevalent when going in and out of driveways even at very slow speeds. Since flipping them over I'm able to get over speed bumps without issues. Posting some new pics..please let me know if anything looks off still. Pics of left and right. Have you tried turning the lower mount for the spherical joint? Looks like lower will bind up facing the way it is. I’d try turning it 90 degrees so it’s in line with the upper joint. Thanks Jon - no I haven’t tried that. Just to confirm you’re suggesting me to have the lower bolt pointing to the outside instead of the inside of the car? Yes, turning the lower joint to work in line with the upper is what I would try. Also, as I look again, how is the clearance between the lock nut and bar? I can’t see if there’s intersection there but it looks like you may need to adjust out the upper joint (make it longer) to get the nut away from the bar.